In 2015, the crab pots sat empty and boats sat idle in small towns up and down the California coast. A wave of warm water—dubbed the Blob—had washed over the West Coast, bringing with it a toxic algae bloom that infected Dungeness crabs with a potent neurotoxin. The state closed the crab fishery, one of the most important economic engines along the coast, for five months. It delayed the crabbing season in 2016 because toxins were still at unsafe levels, causing an estimated $110 million in lost revenue across those two seasons. That’s a preview of what’s to come in a hotter future, which is why crabbers joined the ever-expanding list of people to sue Big Oil. The suit, filed last week in California, is the first of its kind to pit one industry against another and could offer a template to other industries ravaged by climate change. The suit names 30 fossil fuel companies, including Chevron, BP, Exxon, and other multinationals. Together, the defendants are responsible for 15 percent of the world’s carbon emissions from burning oil and gas over the past 50 years. Moreover, many of these companies knew of the risks rising carbon pollution posed to the planet’s climate and instead buried their findings and sowed doubt (they’re also still doing that). Those factors have opened them up to lawsuits by cities, states, and now industries suffering the consequences. The extreme marine heat wave caused algae to bloom and produce copious amounts of domoic acid, a powerful neurotoxin that built up at the bottom of the food chain, including in the meat of Dungeness crabs. Any crabs or other fish where domoic acid is present at levels greater than 30 parts per million is deemed unsafe to eat and cause severe stomach problems or even death. It’s also highly toxic to marine mammals like sea lions. 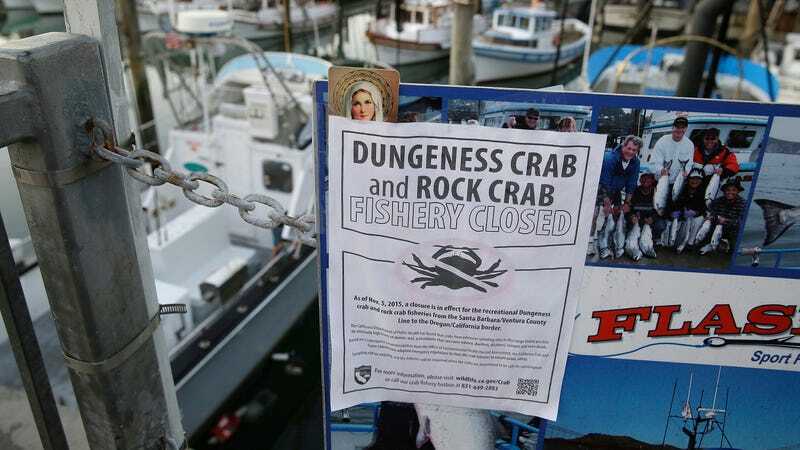 In response to high levels in 2015, California shut down its crab fisheries. This year has seen a partial return of Blob-like conditions, delaying the opening of crab fisheries yet again. Oppenheim said that between now and Christmas is a crucial time for the fishermen and women, many of whom are small operators. Based on those impacts as well as the fact that fossil fuel companies knew about the havoc they were wreaking, PCFFA is suing for damages during the Blob years. Oppenheim said the group is also seeking help implementing methods that can improve predictions of domoic acid outbreaks—which are almost entirely based on temperature—and in solutions like depuration tanks that crabs can be stored in until they get rid of the built up domoic acid. Those solutions can allow the fishery to exist and even thrive in a world where global warming is likely to make algae outbreaks like this ever more common.